We found out my husband's grandfather needed a stent put in this last Halloween. When they went to put in the stent, they found so many blockages that they knew the stent was not the way to go, and they would need to perform open heart surgery. On November 1st, they performed a five-way bypass. The artery known as "the widowmaker" was 99% blocked. From what I understand, it's called the widowmaker because if it becomes abruptly and completely blocked, it will cause a massive heart attack that will likely lead to sudden death. We were really lucky that my husband's grandfather is so active because otherwise, he might not have made it long enough for the surgery to even be an option. I went down to the hospital with my husband and my mother-in-law where we met up with my mother-in-law's brother and his wife. We got to see his grandfather before the surgery. It was a terribly long day - he's eighty-three, never had surgery or been hospitalized before. We worried about him going under the anesthesia, coming off the ventilator, and especially the recovery afterwards. He is tougher than the doctors expected him to be, and his surgery took less time than they thought it would. He came off the ventilator sooner than they thought, and he was released from the hospital a couple days earlier than they thought. He came to stay with us for a couple of days, and then he stayed with my mother-in-law and her mother (who live across the street from us) until he was released to go home. He's been home for nearly a month now, and we check on him by phone and going out to visit often. He's doing really well for someone who went through such an extensive surgery. The five of us who had arrived early in the morning before the surgery went into a private room when his surgeon came to talk with us afterward. He explained the operation itself as well as what would happen now. He noticed I had my laptop with me and asked if I was working. I explained I'm a book blogger and said I receive books in exchange for an honest review. He offered to give me a copy of his book in exchange for an honest review, and so that's how I came to review this book. I'm honored to do so. I must admit I was worried about reviewing this book. I was afraid it would read like a textbook, and I wouldn't understand a word of it. 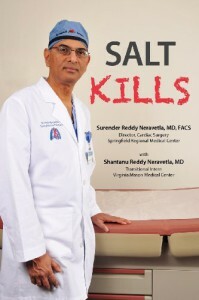 Luckily, I was wrong - Dr. Neravetla wrote Salt Kills as though he's having a conversation with you and explains everything in layman's terms. He includes illustrations to show you what he's talking about as well as simple analogies to help you understand the difference between the way the heart works normally and the problems it encounters from excessive salt consumption. Dr. Neravetla along with his son spent hundreds of hours researching the effects of salt and has well documented his findings, directing you to websites that will give you more information and cement the fact that high salt consumption causes all kinds of health problems. Even some you might not have know beforehand. He explains how salt is linked to each health issue. No one wants any cancer, but stomach cancer is definitely one cancer you do not want. By the time it's diagnosed in most cases it's already too late to cure. You eventually end up not even able to swallow your own saliva. That's terrifying. He spends the last chapter outlining a plan for cutting salt from your diet. There's salt in basically every food we eat, but he lists ten foods that are in his words, "The Top Ten Most Unwanted." He explains it takes most people three months to completely eliminate salt from their diet, but because salt is not addictive, it can easily be done. You won't experience withdrawal like people do when they try to stop smoking. Here's something else I learned that I found completely shocking - the number of cardiovascular deaths is greater than the number of deaths from every type of cancer combined. That's alarming. How many of us know someone who has had cancer, currently has cancer, or has died from cancer? I bet every single one of us know someone personally who has suffered from cancer itself or the effects of cancer. Not to mention if you've had it yourself. As many people as we know affected by this disease doesn't even stack up to the number of people dying from cardiovascular disease every year. The good news is that lowering or better yet eliminating salt from your diet can prevent all of the problems listed above. And it's completely feasible. I highly recommend you grab a copy of this book and once you've read it and have seen the pictures, you'll want to immediately cut salt from your life, too, just like this book has done for me. I want to have a long life, but I want a high quality of life, too.